This connection became so accepted, both in England and the United States (where aping English manners and tastes was in vogue) that the opening of the American production of “Patience” prompted Richard D’Oyly Carte, Gilbert’s and Sullivan’s producer, to capitalize on the show’s popularity by sending Wilde to America on a lecture tour. As previously noted, Wilde arrived in America in January 1882 to begin a four month speaking tour. 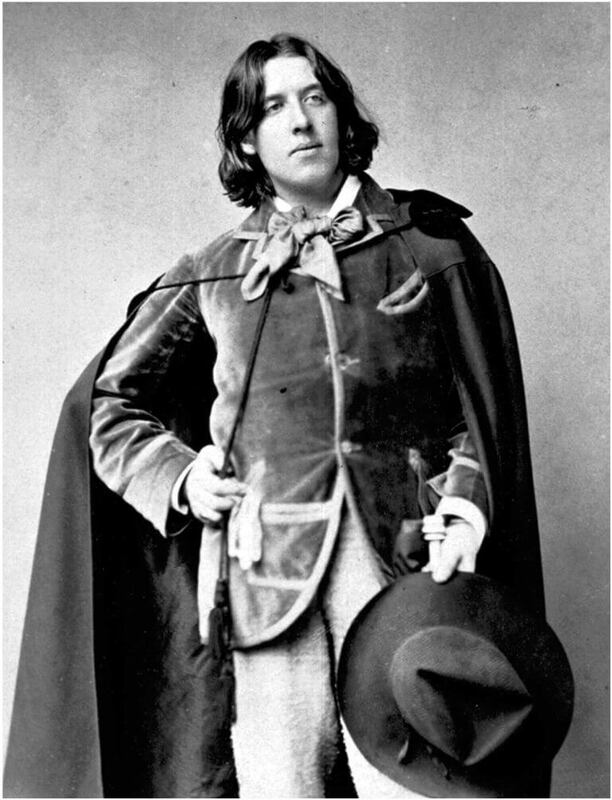 But so popular, or notorious, did Wilde soon become, and so commercially successful his appearances, the tour was extended until December, during which time, he lectured on such esoteric topics as “The Decorative Arts”, and “The English Renaissance”. Instinctively sensing that the American press was a tool which could be used to build and enhance his image, Wilde assiduously catered to local newspapers. He was not adverse to feeding the public’s pre-conceived notions about a 6 ft. 4 in. tall, 200 pound, man with shoulder length hair, dressing in outrageous “aesthete” outfits of knee britches, tight fitting loudly-colored coats, overly-large cravats and silver-buckled shoes. Nor did he shy away from making outrageous and provocative comments and criticisms of America and Americans. Realizing he needed to fight back against the avalanche of cartoons and advertisements (where he received no royalties when his image was stolen to sell cigars, stoves, freckle cures and even bust-enhancing tonics), Wilde looked to photography as the means to project the image he wanted the public to see, an image described by one of his biographers as that of, “intelligence, poetic sensibility and the self-­possessed attitude of a young artist coming into his own.” These photographs became so popular during Wilde’s American tour that he indirectly played a role in a landmark court case when Napoleon Sarony, one of the country’s leading photographers, sued the Burrow-Giles Lithographic Co. for pirating his photographs of Wilde. The issue ended up before the Supreme Court where a decision was handed down explicitly affirming the fact that photographs were “art” and therefore could be copyrighted. 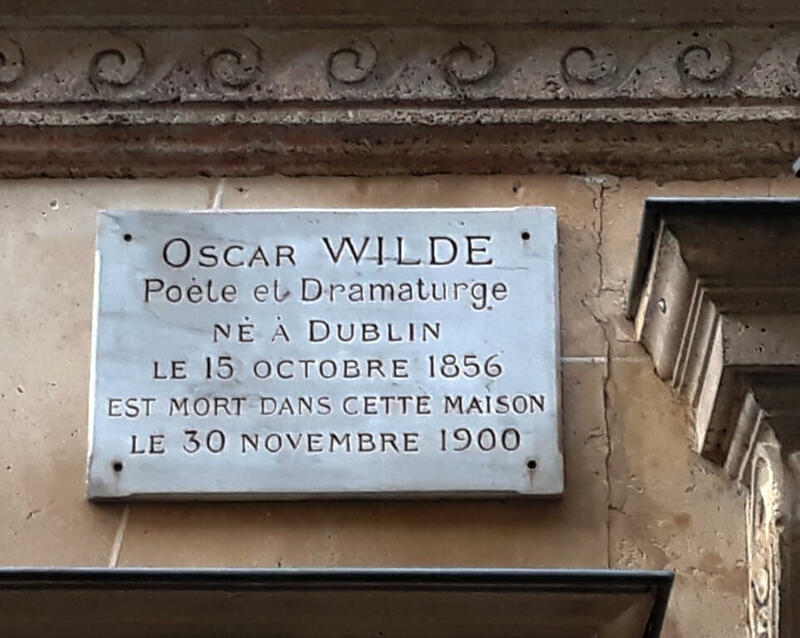 From the beginning of his lecture tour, Wilde’s public persona was satirized and mauled. 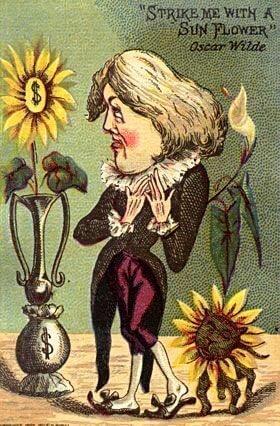 In Boston, at the end of January, a body of Harvard students bought up the front two rows in the Boston Music Hall and just before the lecture began, marched down the center aisle dressed in Wildean costumes of long haired wigs, large cravats, and knee britches, each student carrying a sunflower. However, having been tipped off that Harvard boys were notorious for their unruly behavior, Wilde seized the moral high ground and deflated the students’ high jinks by strolling onto the stage dressed in conservative evening wear with long trousers. Casting a jaundice eye on the students, Wilde said with a smile, “I see about me certain signs of an aesthetic movement…I see certain young men who are no doubt sincere, but I can assure them that they are no more than caricatures….as Wordsworth says, ‘turn from these bold, bad men’.” The students attempted to reclaim the initiative by applauding loudly at inopportune moments, such as whenever Wilde took a drink of water, but were cowed by hisses and boos and cries of ”shame” from the more sedate Bostonians. 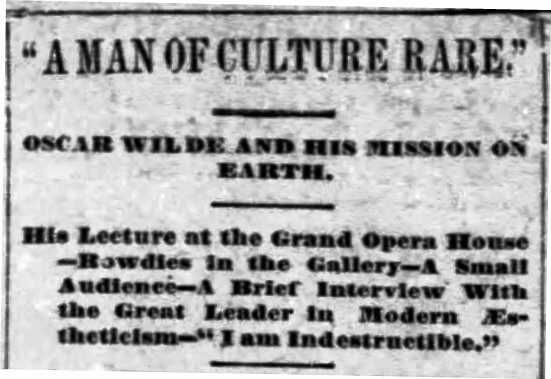 Having been tested by fire, Wilde stepped up the pace of his tour, giving 15 lectures during February starting the month in Connecticut and ending up in Illinois. In New Haven, two days after his Harvard lecture, Wilde was again the target of a student demonstration, this time by 200 Yalies clad in red cravats who marched into the lecture hall carrying the obligatory sunflowers. This time he simply ignored them. 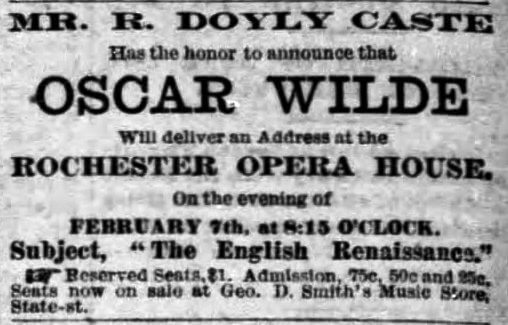 After speaking in Hartford, Brooklyn, and Utica, Wilde and his manservant arrived in Rochester on the late afternoon of Feb. 7. 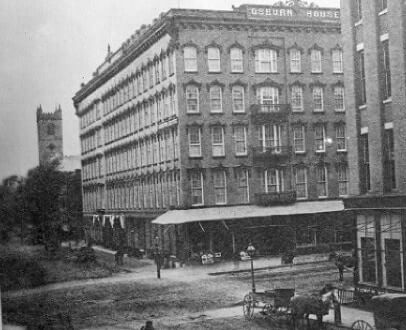 Following a short rest at his hotel, Wilde was driven to the Grand Opera House on South St. Paul Street (now South Avenue) (4) where a “blushing reporter” from the Democrat and Chronicle interviewed him in his dressing room prior to his 8:15 lecture on the English Renaissance of Art. 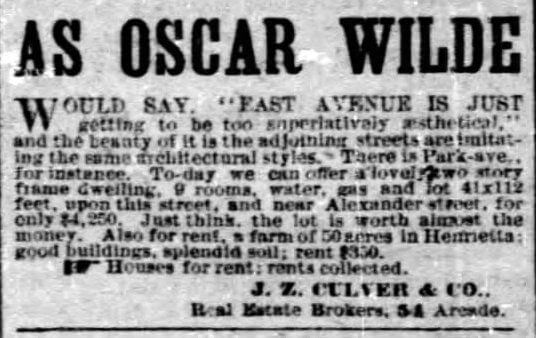 Though the topic didn’t come up, before the interview Wilde might have been informed that local pranksters had earlier sent a letter, ostensibly from Wilde, to the papers announcing that he intended to make an appearance at the city’s annual masquerade ball the previous night. The joke had concluded at the ball when an appropriately-dressed masked imposter danced with a number of “aesthetic maidens” at the “Too Utterly Too Too Club”. Describing Wilde’s attire in detail; “He was dressed in knee britches, black silk stockings, marvelously fitted low patent leather pumps, regulation dress coat, low cut double-breasted white vest, shirt collar turned low with a voluminous white tie”, the reporter then got down to work peppering Wilde with questions. Next he was asked, “How were you pleased with the demonstrations of the Harvard students?” “There was nothing offense in that”, said Wilde, “I understood well enough that it was meant as a good natured joke.” Within an hour he had good cause to reconsider that thought. Following the lecture, Wilde’s manager tried to laugh off the confrontation by claiming that while the students were, “a little demonstrative, there was no malicious attempt to create a disturbance,.” But a reporter from the New York Herald had already filed a somewhat embroidered report of the incident which, to the chagrin of the City Fathers and the administration of the University of Rochester, had been sent all over the country by the Associated Press. The next day’s Union and Advertiser bemoaned “Rochester’s Deep Disgrace” and chastised the students, condescendingly claiming that their actions would be considered the “height of boorishness” even at spelling bees and other rural events. Leaving Rochester for his next lecture in Buffalo, Wilde was doubtless glad to be able to give a sedate talk with no interruptions by any college students in the audience. 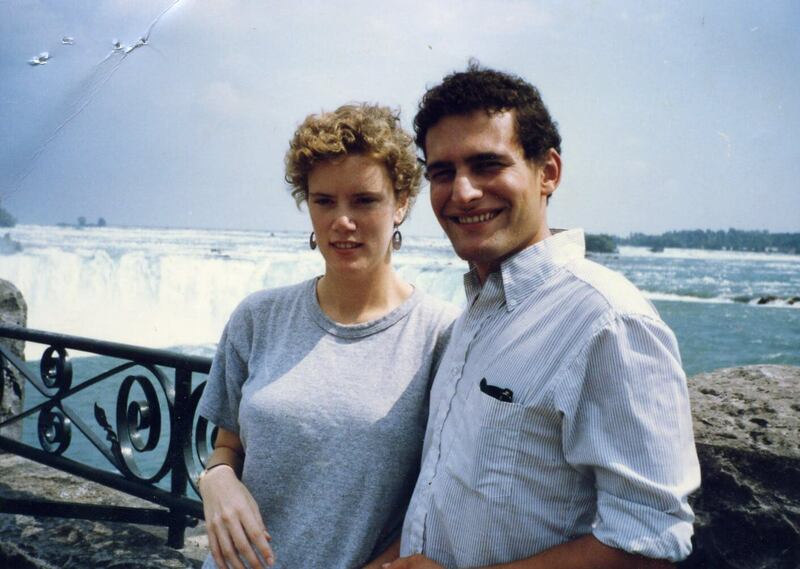 A non-event which led a smug reporter from the Sunday Morning News to take a sanctimonious shot at Rochester. Although he didn’t think that Buffalo was much richer for Wilde’s visit, “For one thing though, the Queen City is to be congratulated. She gave him a respectful hearing, and put to shame the neighbor city of Rochester, where culture and refinement were once supposed to dwell, and where the visitor- a gentleman and a man of ideas- was brutally insulted, and by college students at that.” Some observers thought that the quietude in Buffalo was less the result of their citizens being more civilized, and more the work of Buffalo Mayor Grover Cleveland who, having an eye on loftier political office, had ordered a visible police presence outside the lecture hall to prevent his administration receiving adverse publicity of the kind being heaped on Rochester. Wilde had nine more months of travel and lecturing to slog through after he left Rochester. During his tour Wilde traveled over 15,000 miles, visiting cities and towns coast-to-coast, giving over 140 lectures. Although he had several colorful adventures (for instance, in Leadville, Colorado, “the roughest and most wicked town on earth”, Wilde went down into a mine with a number of “bearded ruffians” where the London dandy talked about art and joined the miners in a three course meal of whiskey, whiskey and whiskey), he seems to have avoided any further heckling by university students. (3) Earlier in London, Wilde had been asked if it was true that he had strolled down Piccadilly carrying a sunflower, to which he replied, “It’s not whether I did it or not that’s important, but whether people believed I did it”. 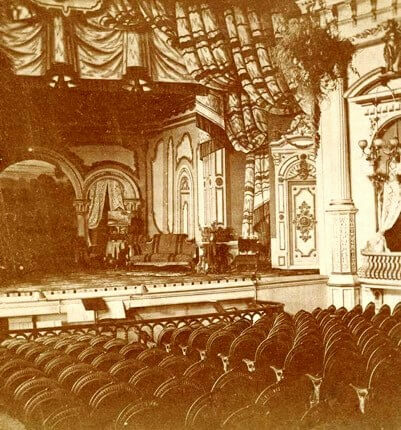 (4) The Grand Opera House was Rochester’s premier entertainment venue. It had been designed in 1870 by a local architect, coincidently named John Rochester Thomas. In 1891 fire destroyed the opera house and a hotel next door. Thomas was credited in his day as being the most prolific designer of public buildings in America (for example, over 150 churches were built using his plans). Before moving in 1877 to the wider architectural vistas offered by New York City, he designed Sibley Hall (Rochester’s first fireproof building, demolished in the 1950s) on the University of Rochester’s campus located at the time on Prince Street; as well as the Rochester Theological Seminary building on Alexander Street, today known as 300 Alexander Apartments. (5) One wonders whether Wilde had seen the earlier edition of the D&C where he was dismissed as, “a fantastic decker out of his person in garments which good taste reproves; an attitudiniser in drawing rooms; and the self-constituted apostle of a school which, so far as can be discovered, embraces only languishing matrons and silly girls, with a few male nincompoops.” Or whether he had read the Letter to the Editor from “Sunflower” complaining that, having paid his dollar to see Wilde, “solely from curiosity”, and having heard that Wilde had discarded his aesthetic garb for simple evening dress (which he had done at Boston), he considered it a case of deception if he didn’t get to see, “the entire flapdoodle outfit”! (6) There are differing accounts as to the severity of the disruption caused by the U of R students and Wilde’s reaction to them.